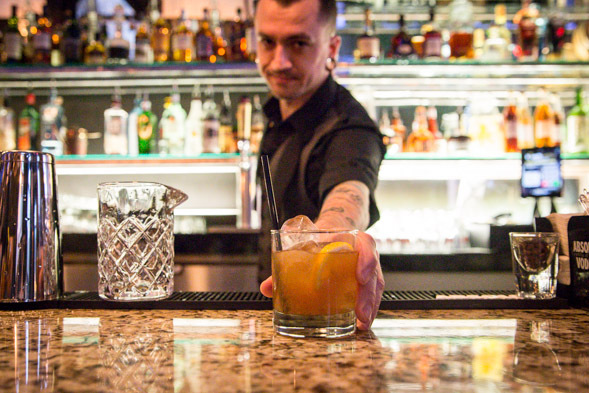 East Thirty Six, an ambitious new restaurant and cocktail bar, is now open on Wellington. It takes over the site that was most recently home to the short-lived Olde Towne Bistro and Oyster Bar and before that, Lucien . 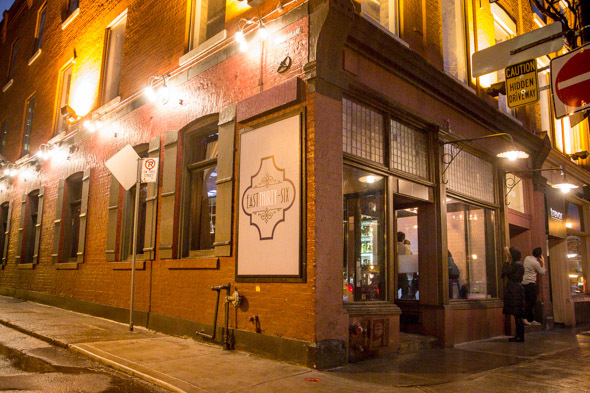 Now under new ownership, Julien and Devon Salomone of Boutique Bar aspire to renew the restaurant with formidable food and an inventive cocktail-focused bar menu. The space has been modestly revamped, retaining the iron work flourishes throughout but switching up the colour scheme from warm to cool tones. Crystal chandeliers have finally been retired and retrofitted with sleek brushed steel fixtures. The room has a stately quality but is somewhat less flamboyant than before. 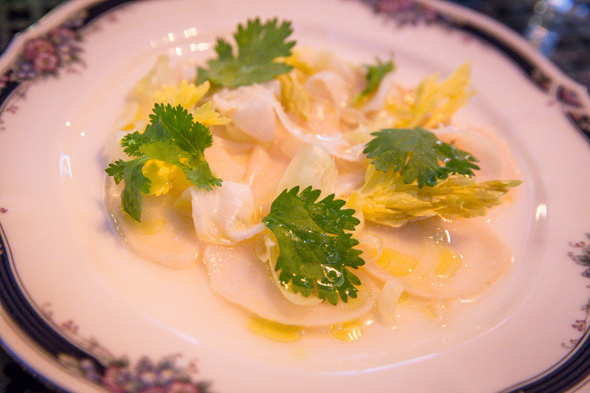 The confident menu developed by chef de cusine Brent Maxwell (of O&B pedigree) consists of a list of attention-grabbing dishes like scallop crudo ($14), burratta ($15), boudin blanc ($18) and smoked sweetbreads ($15). Mixed pickles, raw trimmed radishes with bonito butter, smoked peanuts, and warm olives (each $4), are appreciatively offered to start while skimming the drink list. Wines by the glass hover between $12-$14 and cocktails are priced in a similar range. The Borsalino ($13) expertly blends rye and Cynar, a bitter artichoke liquer, and is sweetened with maple syrup and brightened with tart lime. 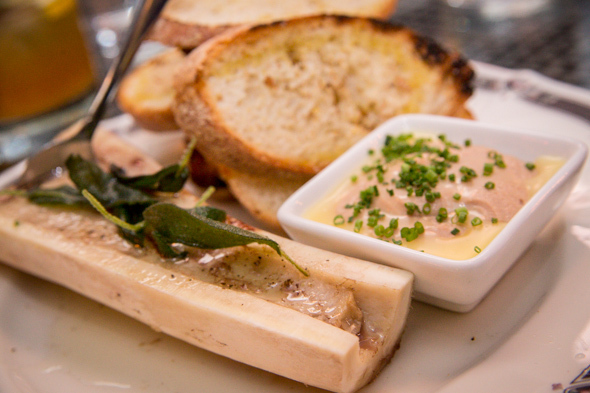 The buttery roasted bone marrow ($16) topped with fried sage leaves is a pleasure. An accompanying pot of chicken liver mousse and generous supply of toast makes it, begrudgingly, a shareable serving. 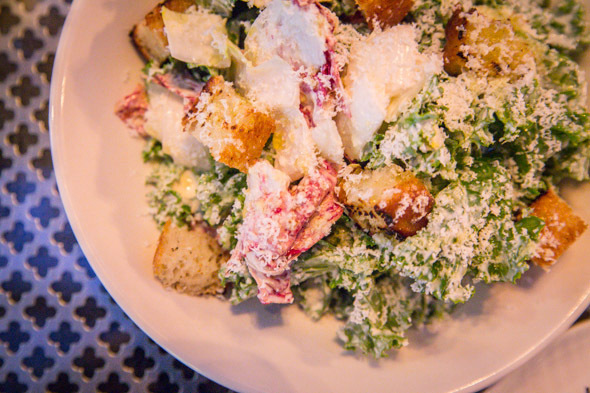 The winter salad ($10) comprised of castelfranco radicchio, kale, endive and soft focaccia croutons comes dressed with ricotta salata aioli. It's a dish that'll appeal to caesar fans without the lingering garlic breath. 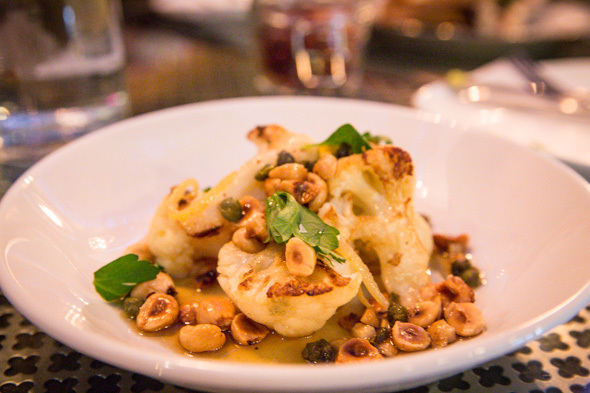 Next up, cauliflower florets ($8) dressed with nutty brown butter and studded with crunchy roasted capers, hazelnuts and preserved lemon rind. Finally, like a perfect decrescendo to an otherwise rich feast, a delicately flavoured halibut steak ($21) set over an aromatic white wine broth swimming with translucent fennel bulb, carrots and halved artichokes. 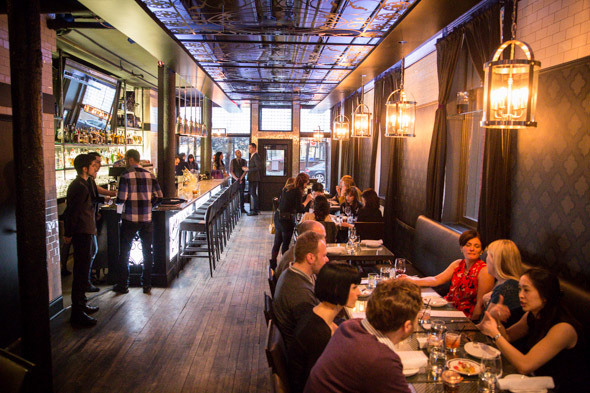 East Thirty Six is open daily for dinner at 4pm. Ex-Lucien patrons will feel right at home with both the atmosphere and menu.